Motivation and Encouragement to help families and kids make healthier choices. Make ONE healthy choice per day to reduce sugar in your daily diet! Are you excited? We are! What does it all mean? What do you do to be part of the pledge fun? The AquaBall Pledge asks kids to make ONE HEALTHY CHOICE a day to reduce sugar. One of the easiest ways to do that is by eliminating a high-sugar beverage, such as a juice box/pouch or a soda, and replacing it with an AquaBall…which has ZERO SUGAR! 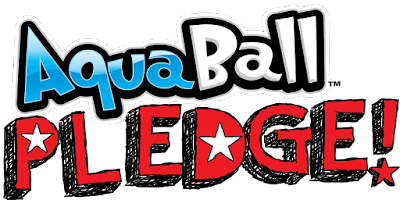 How does the AquaBall Pledge work? * Download & Print the Certificate here or on the pledge page directly. Directly From The AquaBall Headquarters to Motivate us all to Take That Pledge here are the full details.. The AquaBall Pledge is the launch of a national campaign encouraging children to make one healthy choice a day by reducing sugar in their diets. When a child ‘Takes the AquaBall Pledge’ they are joining inthe battle against childhood obesity and diabetes and choosing healthier options. The children are sent a wristband, a coupon for a free AquaBall and merchandise. As they complete each month a new wristband is sent out to them, with a new color. Once they complete three months they receive a gold wristband and will be entered into a drawing for an AquaBall Party with their friends. To find out more information and to take the AquaBall Pledge go to www.aquaballdrink.com/pledge. Aubrye Foote, Chief Mom of True Drinks, stated, “Kids drink more than they eat and most of the kid’s beverages on the market today are packed full of sugar. Even if there isn’t any ‘added sugar’ in the beverage, one drink can exceed the daily amount of sugar a child should have. Our idea was to create the AquaBall Pledge to encourage families to have fun while making a healthy choice at the same time. We are joining in and we are loving it! Kick off SUMMER with a Healthy Pledge to keep hydrated but with out the sugar! Tag your social posts with #AquaBallPledge to show your healthy side too!